You knew that title was coming right? I mean I didn't really fool anyone with it, and although it's not the most clever thing that has ever whirled through my cortex, I kind of like it, so I'm keeping it, thank you very much. I'll also warn you that this is also going to be a completely biased take on this movie so if you're looking for more objective opinions, perhaps more takes on the technical aspect of the film, I encourage you to check out my friend Chris' blog HERE. As it is, this will probably end up sounding like a love letter to Steven Spielberg and J.J. Abrams, and you know what, at this very moment, I kind of feel as if that's warranted. I'm contemplating the idea of writing a separate blog to really flesh out why I had the reaction I had to this movie, my own homage to Spielberg, which is probably long overdue, and just keeping this as succinct as possible, which, really, is probably the best option. If you clicked here, you wanted to know about Super 8, not about how I cry every time I watch E.T. right? So here goes. To put things as simply as possible, with all romanticism intended, I feel like the quote on the TV spot for Super 8, the one that says something to the effect of "Spielberg and Abrams remind us of what it means to go to the movies" is entirely appropriate and deserved. I've never been the kind of person who could only take technicalities alone into consideration. I'm more of a heart-on-your-sleeve/sob-not-so-quietly-into-your-napkin/I-can't-believe-that-commercial-where-the-dad-drops-the-daughter-off-at-college-made-me-weep-openly kind of girl. I like emotion. I like feeling my heart strings tugged. I enjoy nostalgia as much as I enjoy looking forward. Super 8 is like the best of all of those things combined, and while it's not perfect, it's entirely satisfying. 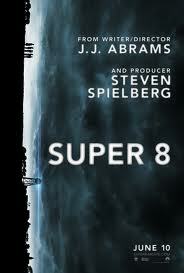 Directed by J.J. Abrams, the current heir to Spielberg's story-telling throne, Super 8 begins on a cold winter's day made all the more bleak by a funeral. In the fictional town of Lillian, OH, and steeped in the atmosphere of 1979 Americana, Joe Lamb (newcomer Joel Courtney) has lost his mother in a factory accident. "Did you see what was in the coffin?" asks a young boy at a dinner table, and I mentally shake my first at Mr. Abrams because only he would be allowed to remind the audience that, oh yeah, I'm the guy who came up with LOST. Skipping ahead 4 months, it's the last day of school and Joe and his friends are making plans to finish the movie they've been working on. Charles Kaznyk (Riley Griffiths) Joe's best friend is a Spielberg/Abrams hybrid, an ambitious boy with dreams that clearly stretch beyond the Cleveland film festivals, who is determined to make his zombie movie the best it could possibly be. Three other friends, over-anxious Martin (Gabriel Basso), entirely too cautious Preston (Zach Mills) and pyromaniacal Cary (Ryan Lee) make up the unlikely film crew and all are, presumably, besotted with Alice (Elle Fanning) a last minute addition to the production, a pretty girl from the wrong side of the tracks. On the night of their big shoot, a train crash of magnificent proportions occurs, in which something that is decidedly not human escapes and begins to turn their small suburban paradise into a danger zone. The adventure that ensues is part creature feature, part disaster movie, and entirely a coming-of-age tale that is full of so much heart and innocence that it's difficult to leave feeling anything other than hopeful. The comparisons of this film to Spielberg (who, in fact, produced Super 8) are inevitable, and some might say, through the marketing campaign, even welcomed. They're banking on the fact that you loved Spielberg as a kid, and if you did, chances are you'll like this too. But there's something essential that you must remember going into this movie. You must be entirely willing to lose yourself in the story, participate in escapism of the first degree. There are bits of what feels like just about every pre-Schindler's List Spielberg adventure movie, and I'm pretty sure that Abrams has not shied away from saying that yes, this is essentially an homage to the kind of movies that he watched as a kid, which just happened to be directed by, well, you know who. Similiarities will most easily be seen with Close Encounters and E.T. Perhaps it's just that I'm less familiar with Close Encounters, but Super 8, side-by-side, seems most related to E.T. but not in entirely conventional ways. The fundamental details of Super 8 seem to be almost an exact negative of that film. Where E.T. is a story about a middle child being raised by a single mother, Super 8 is the story of an only child being raised by a single father. Where E.T. is entirely about the creature, I would argue that this film only uses the creature as bait. While E.T. only featured Elliott and his bond with the (I think) adorable, wrinkly, pot-bellied alien until about the last 20 minutes of the film, Super 8 offers the audience is a glimpse at what it would have been like to see all of Elliott's brothers friends interact the entire time, with the focus on the bond of human relationships in the face of alien threats and all that entails. And yet, there are similarities. The "them" in this US vs. Them scenario is the military and the boys must still ride their super-bitchin' BMX bikes and drive under-age to evade these (unfortunately) one-dimensional villains at every turn. There are glimpses of Jurassic Park, particularly in a scene involving an escape from a bus and there's a nice nod to Indiana Jones as, at one point, Kyle Chandler is forced to knock a guy out and take his uniform to blend in (a moment which elicited whoops from our audience). There are reminiscences of JAWS in the buildup of the suspense of the creature reveal and the adults still just don't really get what it's like to be a kid and remain in the periphery of the story until their necessary moment of clarity arrives but these are all things I'm fine with. And while it would be tempting to say "hey this sounds almost EXACTLY like (insert film title here)" there are enough of the films technical aspects to set it apart as a J.J. Abrams movie. The train crash is an impressive visual, and the photography and lighting are heightened and, in moments, especially the moments at night, there's a slightly futuristic feel to the exposed lighting and glints that are often cast on the actors. The soundtrack is also distinctively Abrams, once again handing over the score reigns to Michael Giacchino, whose subtle emotive notes seem to make every moment complete. When there isn't original score playing there is the constant reference to pop music, everything from Blondie's Heart of Glass to The Knack's My Sharona substituting as your guide to awareness of where you are in time and place. Funnily enough, it was this aspect that stood out to me as distinctly different from Spielberg. While (I'll be presumptive and call him) Steve's films always have the ever-present John Williams, he rarely branches out into pop territory. This is one of the clearest indicators that this is a film made by a man who was actually 13 during 1979, and the clearest indicator that there is, along with a lot of fantastical elements in the film, also a nice chunk of nostalgia and authenticity that inform its production. By casting relative unknowns, Abrams has allowed for the kind of clean-slate experience that audiences so rarely get these days. Most of us have no preconceived notions of Joel Courtney or Ryan Lee or Riley Griffiths, and so we allow them to be what we see onscreen: boys figuring out that the world may not always be what they want it to be, but still with enough ignorance to believe they can make things right. I have to say, that the casting of Joel Courtney is equal parts luck and brilliance, as he's a young actor that has such an open, honest face he can convey the emotion in the raise of an eyebrow, and heck, you just want to root for him. Elle Fanning is a standout as well, and Abrams brilliant direction of her first "zombie movie" scene does almost make you stop and stare. It's the kind of understated, hit you in the gut, kind of scene that can be found in these kinds of movies, my favorite example being the scene of Brody and Michael at the dinner table in JAWS. Is the film perfect? Not entirely. For me it loses steam with the military storyline. That's just there for the explosions budget, to keep the people who are getting too antsy for a Michael Bay movie, at, well at bay. But it shines in it's moments featuring the kids, and that's the majority of the film. For me, what Abrams has done so well is he's captured the ESSENCE of why people fell in love with Spielberg films; he's captured the emotions. When I think of Spielberg's older films, the ones that are truly a part of my childhood and the fiber of who I am, one word comes to mind: wonder. It is not the type of wonder that is used as a verb, to ponder or deliberate. It's the kind of wonder that is used as a synonym for awe, the kind of feeling that can only really be experienced when you're open to believing in something because your unawareness of what life might have in store for you hasn't yet taken root to allow for cynicism to grow. That kind of wonder is what Super 8 has in spades, and I'm ok falling for that, even if it's not my first time at this rodeo. It's a movie about growing up, first loves, what it means to be afraid, and learning to let go. And what can I say, I sometimes just love movies made by guys who love movies the same way I do and aren't afraid to let it show.